Dental implants are the most permanent solutions to tooth loss. Whether you are missing a single tooth, multiple teeth or all your teeth, dental implants are arguably the best way to renew your smile, your chewing efficiency and your quality of life. When a tooth is lost, the specialized bony process that houses the tooth begins to resorb due to lack of stimulation. This causes a decrease in width and height of the bone in the area that the tooth was lost in. Neighbouring teeth and opposing teeth soon begin to move into the space. This causes food lodgement, subsequent decay, gum disease and abnormal forces being transmitted to the remaining teeth. This can lead to fracture of cusps which may necessitate root canal treatment or extraction. 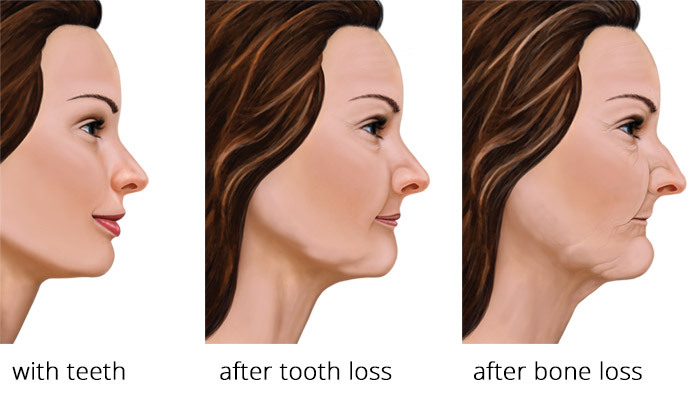 Tooth loss can also cause the cheek and lips to collapse giving a more aged look. The consequences of tooth loss can be prevented by replacing the lost tooth in a timely manner. Although there are several options available to replace a missing tooth, the number one choice for replacing lost teeth are dental implants. Implants are tiny titanium screws or posts that are surgically placed into the bone. Once integrated into bone, they act like roots onto which small posts are attached – that protrude through the gums. These posts provide stable anchors to the replacement teeth. Implants maintain the bone height by stimulation and prevent unnecessary trimming of adjoining teeth like with a conventional dental bridge. Since implants are titanium posts there is no chance for them to decay. Implants can service you for a lifetime with regular professional cleanings and proper home care. Many people who are missing a single tooth opt for a fixed bridge. However, bridges may require the cutting down of healthy, adjacent teeth that may or may not need to be restored in the future. Then there is the additional cost of possibly having to replace the bridge once, twice or more over the course of a lifetime due to decay or gum problems affecting the anchor teeth. Another option to replace missing teeth is a removable partial denture or complete denture depending on the number of teeth missing. The chewing efficiency with a denture is reduced to more than half of that of natural teeth. The teeth that support the partial denture are weakened due to the excessive loads acting on them and eventually are lost. The denture rests on the gums causing tissue abrasion and bone loss. Removable dentures may slip or cause embarrassing clicking sounds while eating or speaking. Studies show that within five to seven years there is a failure rate of up to 30% in teeth located next to a fixed bridge or removable partial denture. These are just some of the reasons that make dental implants far superior to other treatments available for tooth replacement.